Well, it's shame that Frank Lampard wasn't fit and his much-anticipated clash with Steven Gerrard didn't happen. By the looks of things New York City FC will need Lampard fit and available as soon as possible. Hopefully you enjoyed our coverage of the match and we look forward to bringing you some more MLS action again soon. Bye for now. The referee blows his whistle and the New York City FC players look mighty relieved. An absolute walk in the park for Steven Gerrard, Robbie Keane and co. The victory sees LA Galaxy go back to the top of the Western Conference. A bit of late pushing and shoving involving Sebastián Velasquez and Robbie Rogers. Frustrations for the visitors starting to boil over. Robbie Keane and Steven Gerrard almost toy with the New York City FC defence as they try to tee each other up inside the area. It's almost as if neither wants to apply the finishing touch, as a last-ditch tackle denies Gerrard after Keane cut the ball back. The home fans break out into 'oles' as their team pass the ball around with confidence. They might have been deprived of one of half of the Steven Gerrard v Frank Lampard show, but they've more than got their moneys worth. LA Galaxy quickly restore their four-goal advantage. The easiest of goals for the unmarked Robbie Keane who gets on the end of a low cross from Robbie Rogers and taps home from close range. All too easy for LA Galaxy now. Patrick Mullins is bundled over inside the penalty area and David Villa makes no mistake with a low spot-kick as he sends LA Galaxy goalkeeper Donovan Ricketts the wrong way. It's just a consolation for the visitors, though. Another chance for Robbie Keane, who curls over the bar. New York City FC's players look like they have thrown in the towel. The heat is sapping their legs and Andrea Pirlo is soon withdrawn from the action. The cameras cut to glum-looking Frank Lampard. Perhaps if he had been fit it might have been a bit different? The finishing that LA Galaxy were missing in the first half has been found in abundance in the second half. Steven Gerrard has hand in this one as he whips the ball into Sebastian Lletget, who is left with a simple close-range finish. New York City FC fans respond by throwing on some blue ticker-tape on to the pitch. Is that the MLS version of Barcelona's white hankies per chance? New York City FC in danger of finishing on the end of a cricket score here. Former Tottenham and Barcelona player Giovani dos Santos beats the offside trap and finds himself one-on-one with Josh Saunders. Another cool finish in front of goal as he clips the ball over the onrushing goalkeeper and it drops into the net. Another chance for LA Galaxy as Robbie Rogers receives the ball on the overlap and attempts to side-foot the ball in from a tight angle. The shot doesn't have the power to beat Josh Saunders, though. A pretty quiet evening for Steven Gerrard thus far, although he's not really had to exert himself too much. Stoke City midfielder Charlie Adam has tuned in to watch his former Liverpool team-mate Steven Gerrard. Hard to see a way back for New York City FC here. Their play has been pretty disjointed and they look like a team still finding their feet. Need a bit of magic from David Villa from Andrea Pirlo if they are to salvage anything you feel. A lovely crisp finish from Robbie Keane. The Republic of Ireland striker times his run to perfection to beat the New York City FC offside trap to latch on to a superb through ball from Giovani dos Santos. With just Josh Saunders to beat Keane expertly chips the ball over the visiting goalkeeper and into the net. A half chance for David Villa who strikes a volley over the bar. Could this be a sign that New York City FC are getting their act together? The players are back out on the pitch and we're back under way at the StubHub Center. New York City FC head coach speaking to Sky Sports at half-time: "We started well and had great chances, but we suddenly fall apart. "We've give the ball away too cheaply. We have to be better with the ball because a team like LA Galaxy can punish you." Although they won't go head-to-head tonight, Steven Gerrard admits he will relish the friendly competition with Frank Lampard during their Major Leage Soccer adventure. Gerrard said: "When the game's over we become friends again. "It mellows when we're not competing against each other, of course, but we're both winners, we're both professional." Frank Lampard is watching from the stands at the StubHub Center. In the build up to the game, he spoke about his rivalry with Steven Gerrard which he claims "is different now". Lampard said: "We had many rivalries over the years with Liverpool and Chelsea and it was intense. It will be no different the fact we want to win badly. Read more of Frank Lampard's interview with Football Focus here. How there's only been the one goal in this is beyond me. LA Galaxy have been all over New York City FC, although the visitors have threatened at times. Off the line! Giovani dos Santos clips a cross shot into the area and only a last-ditch clearance denies him. Moments later Josh Saunders parries a low cross into the path of the Mexican and only desperate defending from the away team denies him. At the other end Tommy McNamara bundles his way into the LA Galaxy area, however he lifts his shot over the crossbar. What were we saying about a goal being around the corner? The New York City FC defence are caught half asleep by a quickly-taken free-kick which allows Robbie Keane space to cross from the right flank. Keane's ball picks out the head of Gyasi Zardes who glances a header into the net. No chance for visiting goalkeeper Josh Saunders. The visitors are really under the cosh here. Giovani dos Santos seizes on a wayward pass and brings a fine save out of New York City FC goalkeeper Josh Saunders. Surely only a matter of time before LA Galaxy score. Some excellent build up play involving Sebastian Lletget sees the former West Ham youth teamer scoop the ball into the path of AJ DeLaGarza. But the assistant referee had already raised his flag. A high cross into the penalty area drops at the feet of Robbie Keane who cracks a powerful effort against the crossbar. LA Galaxy starting to take control of this game now. 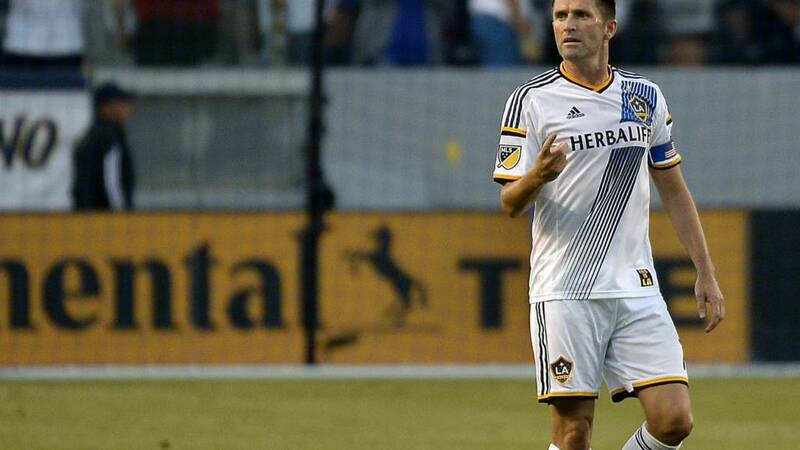 Two chances in succession for Republic of Ireland striker Robbie Keane. Good work down the right flank by Gyasi Zardes and he cuts the ball back for Keane, who sees his shot near the penalty spot blocked by Shay Facey. Moments later a high ball in the box picks out Keane but he is unable to generate enough power or direction with his header and the ball drifts agonisingly wide of the post. New York City FC striker David Villa spins his man on the edge of the box and unleashes a sweet shot which bounces just in front of LA Galaxy goalkeeper Donovan Ricketts. The former Bradford man is equal to it though and shows strong hands to beat the ball away from goal. A grassy bank to park your picnic blanket on for afternoon tea in the sunshine? What more could you ask for? Frank Lampard might be missing but there is an Englishman starting in the New York City FC side. Manchester City defender Shay Facey, 20, has made a decent impact having joined on loan initially in March. That loan has since been extended and although Manchester-born Facey has yet to make a senior competitive appearance for Manuel Pellegrini's side, he is a regular starter for his temporary club. A snap show from distance by LA Galaxy's Giovani Dos Santos, however Josh Saunders gathers safely. Both teams testing each other out at the moment. A lovely lofted pass from the hirsute Andrea Pirlo, who has effortlessly strolled around the pitch thus far, sends former Spain striker David Villa scampering away but his shot is saved by LA Galaxy goalkeeper Donovan Ricketts. Right, that's the Star-Spangled Banner and pre-match pyrotechnics out the way. We're finally under way in a sun-drenched Stubhub Center. Steven Gerrard and Robbie Keane might look relaxed here with LA Galaxy boss Bruce Arena but you can bet your bottom dollar they will fired up come kick off. And the players are out on the pitch as the American national anthem is sung kick-off is just a matter of minutes away. "I had a couple of opportunities a couple of years ago.They didn't happen in the end.," Lampard said. New York City FC head coach Jason Kreis speaking to Sky Sports about the decision to leave Frank Lampard out against LA Galaxy: "If he was going to be on the bench we needed him to be flying and ready to come and make an impact late in the game. "He's really close to playing but this is not the one to throw him in for. Hopefully he'll be fit for next week against Columbus Crew." If you need any help making up your mind on who will be the bigger hit in MLS, here's a snapshot of what both players did back in English football. Lampard looks to have the edge in terms of Premier League appearances, goals, assists and win percentage. He also won more overall trophies than his England counterpart. Of course, statistics don't tell the whole story. Both Steven Gerrard and Frank Lampard have decided to finish their careers across the pond in Major League Soccer. Now we know that Lampard isn't fit tonight but we would still like to know which of the two legendary midfielders do you think will be the bigger hit on the pitch in the United States? And with the supporters? Will the passion which Gerrard played with for Liverpool that so enamoured him to the Kop see him be the most successful? Or will Lampard's shear weight of goals and assists make him top dog? Let us know your thoughts using #bbcfootball on Twitter or texting us on 81111 (UK only and please let us know your name). As well as New York City FC team-mates Andrea Pirlo and David Villa, Frank Lampard has been rubbing shoulders with former Italy forward Alessandro Del Piero this week. He posted on his Instagram account on Saturday: "Great to be back on the training pitch with the lads. Also to meet a player I've admired so much over the years in Alessandro Del Piero. Big game against Galaxy for the team." LA Galaxy coach Bruce Arena speaking to Sky Sports before kick-off: "Steven Gerrard is a great professional and you know his talent and experience. "He's quickly won over our team and our fans. When you stick him next to Robbie Keane it gives you something special." Of course, Robbie Keane and Steven Gerrard are not the only players in the LA Galaxy squad that are familiar names to fans of football in these parts. Jamaican goalkeeper Donovan Ricketts is remembered on these shores for a spell with Bradford City from 2004 to 2008 having failed to make an appearance with Bolton Wanderers. Finland midfielder Mika Vayrynen played for Leeds United while defender Robbie Rogers was also on the books at Elland Road and had a loan spell at Stevenage. Mexican Giovani dos Santos played for Tottenham, while fellow midfielder Sebastian Lletget was in West Ham's youth team. New York City FC are without Frank Lampard through injury, but still include Andrea Pirlo and David Villa in their team. As we were saying, the LA Galaxy marketing men have really gone to town on the Steven Gerrard v Frank Lampard rivalry. Of course, we were not the only ones caught short by Frank Lampard's absence from the New York City FC side. The marketing men for LA Galaxy clearly banked on him being fit and billed this contest to the American public as a clash between the two heavyweights. They mocked up the match in the style of the old school boxing posters under the headline 'The British Invasion'. At least, we had hoped to bring you Steven Gerrard v Frank Lampard. The problem is Lampard has not been included in New York City FC's matchday squad because of a calf injury and misses the match. Still, we still have Gerrard, Robbie Keane, David Villa and Andrea Pirlo to look forward to so stick with us. It only seems like yesterday that Steven Gerrard and Frank Lampard were scrapping it out in the Premier League for major honours. How times have changed. In the Autumn of their careers they have resumed their rivalry on the other side of the Atlantic in Major League Soccer. This evening they were set to go head to head the first time this time as Gerrard's LA Galaxy take on Lampard's New York City FC. And we'll bring you kick, tackle and goal in our live text commentary of the match from the StubHub Center in California.